Well, I'm definitely experiencing the ups and downs of the life of a first-year teacher. Graph Paper Index Cards. I ordered these online for 62 cents per pack of 100. I gave them to my Algebra 2 students for a pop quiz on graphing. They worked great. But, I definitely learned my lesson. Students didn't label anything on their graphs. Names and equations were written on the back. 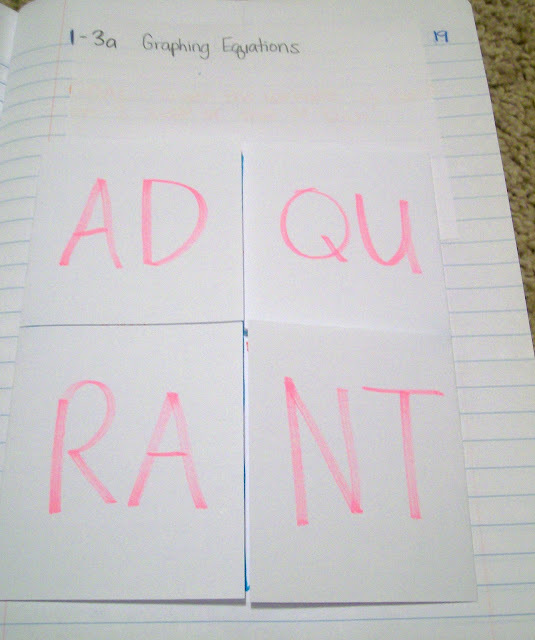 So, I had no idea of how I was supposed to orient the index card to grade it. I just had to keep flipping it around until the graph was correct and HOPE that the student really graphed it correctly. Lesson learned. Stickers. I picked up these adorable stickers at Family Dollar this week. 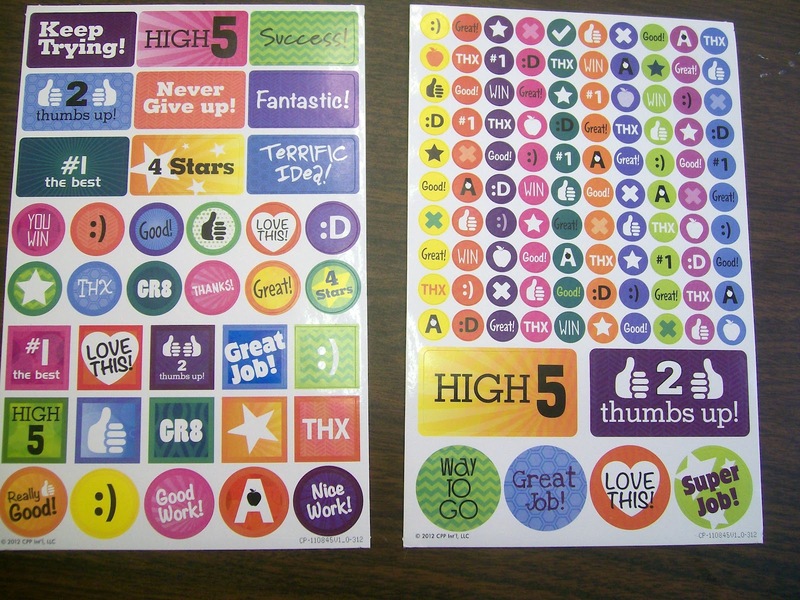 There are 500+ stickers in the package for a whopping $1.00. I put a sticker on the quiz of each student who earned an A. Students were pretty excited to compare their stickers. I had one student who kept asking me to give him a sticker... High school students are definitely not too old for stickers. 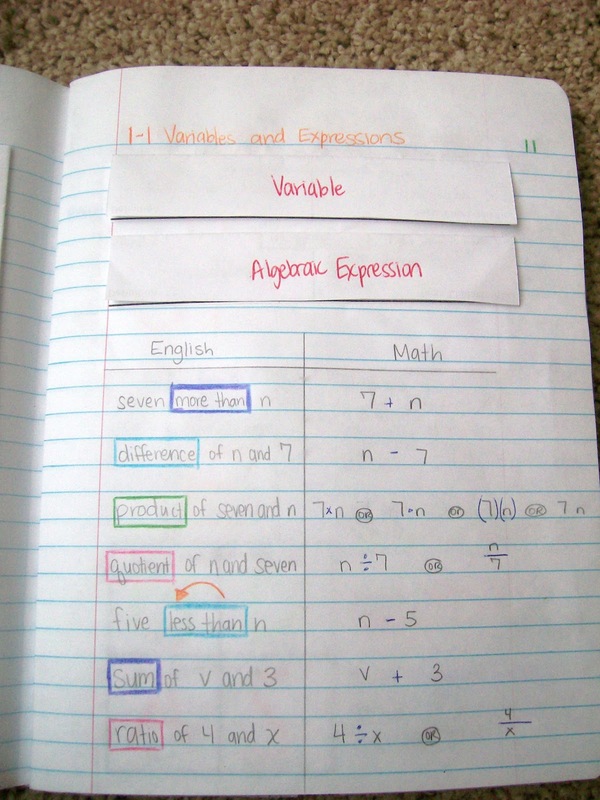 My students love interactive notebooks. My students love solving problems on the dry erase pockets. For the most part, my students love coming to math class. It's a beautiful thing. They feel compelled to tell me things like "This class makes my day" or "This is my favorite class." I have several Algebra 1 classes of students who have previously struggled in math. When these students first came in my classroom, they let me know instantly that they did not want to be there. Math was not something that they wanted to be a part of their lives. I've been going extremely slowly in my Algebra 1 class, and light bulbs are coming on. With lots and lots of practice, my students are finally getting math. They look forward to our practice problems because they are a chance to be successful. One of my students dropped out of school. The fact that I only have 69 students means that I am able to get to know each one of my students so much better than, for example, when I saw 143 students a day during my student teaching at the middle school level. I know that his dropping out has nothing to do with me, but I still feel partially responsible. The last day that he was at school, I sent him to the principal's office. He wouldn't stop talking while I was trying to give instructions. After asking him 3 times to talk, I decided to fix the problem by moving him to a different table. Upon asking him to move, he replied, "That ain't gonna happen." I'd been working so hard to win over the trust of that class period. I knew I couldn't let him run the class. I had to show that I was in charge. So, I informed him that he would either move to the other table or go to the office. At this suggestion, he gladly decided to go to the office. I never saw him again. I gave my first quizzes this week. My Algebra 2 students are terribly behind. 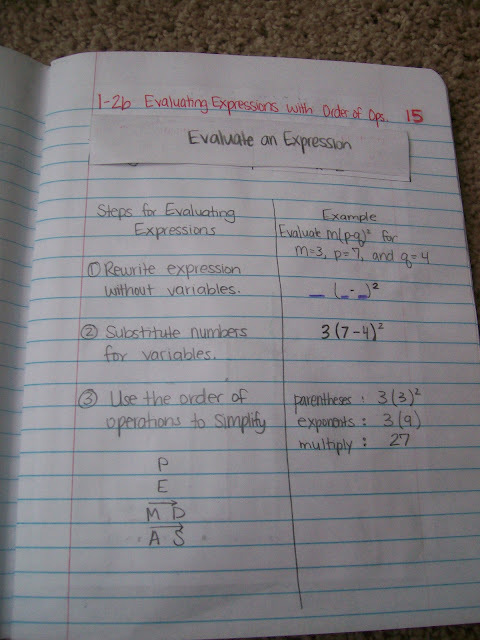 They are struggling with very basic Algebra 1 concepts such as combining like terms, integer operations, and evaluating expressions. After pleading for help on twitter, a tweep suggested that I start doing Algebra 1 review as bellwork so I could move on with the curriculum and start to cover some actual Algebra 2 concepts. In Oklahoma, students are required to take an End-of-Instruction exam in May. I tried this, and it really worked. 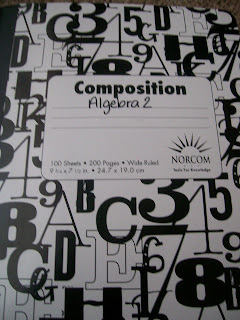 My students had been complaining that we were doing 6th grade math and not Algebra 2. I would love to jump straight into Algebra 2, but my students couldn't successfully complete the review sections of Chapter 1. I think the problem is that, though they are behind in math, they do not realize that they are behind in math. I have students telling me that x plus x is x squared. And a negative times a negative is a negative. I can't change the fact that the students at my school are anywhere from 1-3 years behind in math. But, I can decide how I will respond to this fact and use it to guide my teaching. I hope to stay in this town and at this school and help build up our math program. My college algebra class is not at all what I thought it would be. Today, I wanted to share what has been my favorite foldable of late. It's so versatile, and I've found myself using it left and right in my interactive notebooks. It's a simple four-door foldable. I've sized mine to fit in a composition notebook. 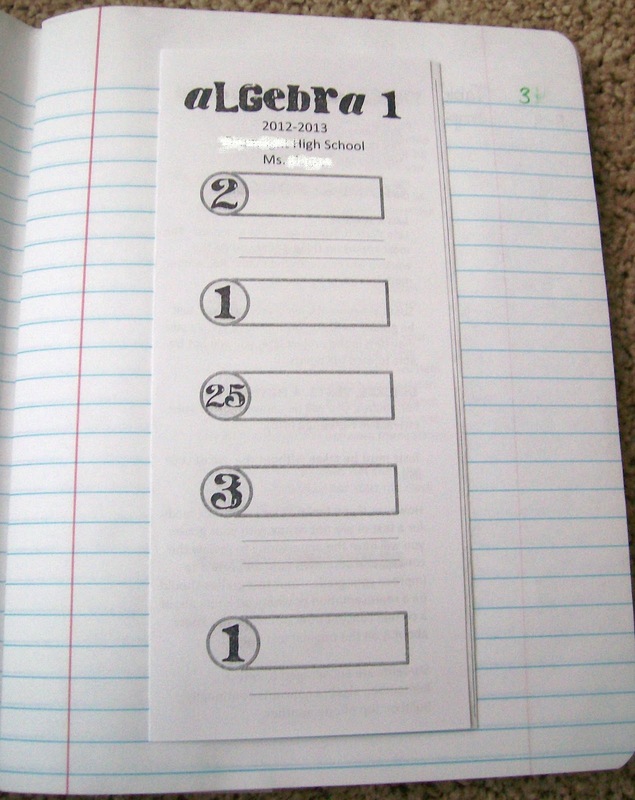 If you aren't gluing these in a notebook, I would suggest you use an entire sheet of paper so that your students will have more room to write. 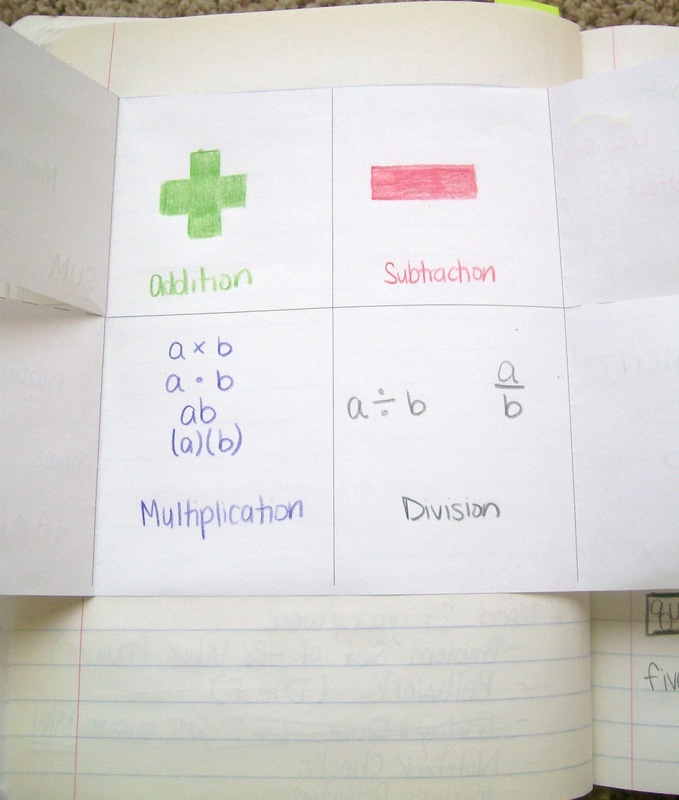 Here's a link to the composition-sized foldable. 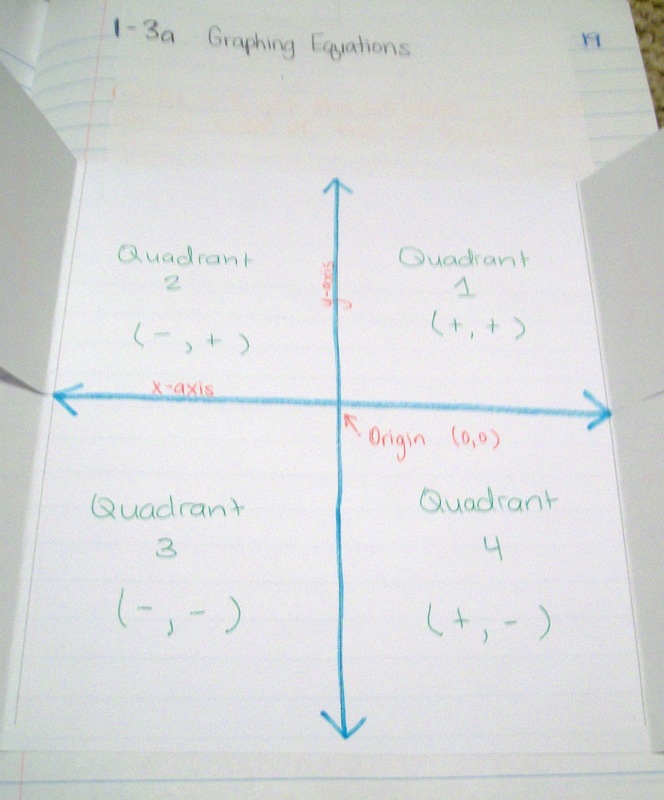 So, here are some pictures of this foldable template in action. I've used this template more than any other so far this school year! Here are pictures from Algebra 2's INB for week 1. Well, this is actually only Monday-Thursday's INB pictures because I took these pictures Thursday night. I'll have to post Friday's pictures later. I'm doing interactive notebooks with my Algebra 1 and Algebra 2 classes. These are the pages I planned out this summer and posted my rough drafts of before. Some of them are the exact same as my rough drafts, but I changed others dramatically. I'm learning that my INB is not going to be perfect. 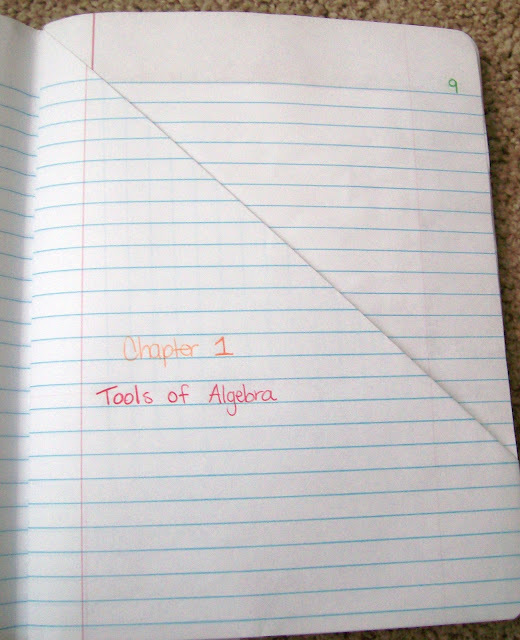 Honestly, you don't want to see Friday's Algebra 2 page. It's horrible. I was feeling uninspired, and it definitely shows. I keep reminding myself that the more I work with these, the easier it will become. This is new for me. I've never done these before, and I'm just making them up as I go. ***Note: So, this post has been setting in my drafts for over a week now. This is old news now, but I still wanted to post it. Well, the first two days of school are over. So, this means that I am officially a teacher! The first two days went really well. I love my job. I love my school. And, I love my colleagues. My classroom is perfectly situated. On one side of my classroom is the bathroom. 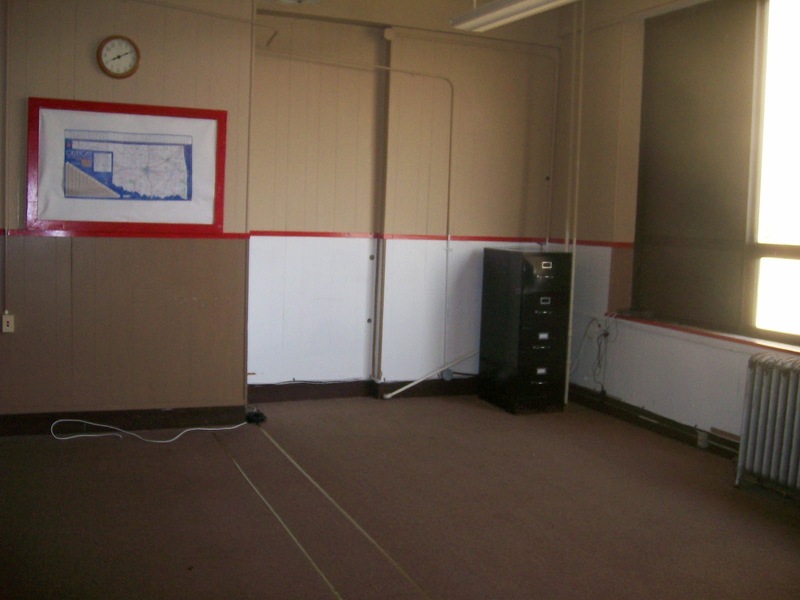 On the other side is the teacher's lounge which has my mailbox and the copy machine. Then, right across the hall is the other math teacher. Day 1 went pretty much as I had planned. I wrote about my plans for Day 1 here. I explained the concept of bellwork to my students. I don't think any of them have ever had a class before where they were expected to begin working on something before the bell rang. 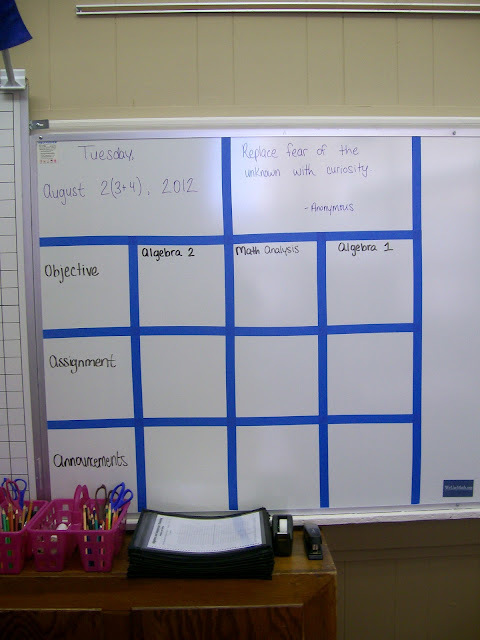 Even though I had the instructions on the white board, many of the students still needed my prompting to get started. Most of my students had no clue where to start. But, I encouraged them to just try something and see if it worked. There was instant frustration, but I told the students I was going to let them struggle with the problem on their own for a few minutes. We had some great discussions about why you couldn't just put ten zeros or a nine followed by nine zeros. For the first six class periods, I let the students try by themselves for a few minutes, then I directed them to the board where we solved it together as a class. I chose one student to give us a number to start with. Then, as students found a problem with the number on the board, they would raise their hand. I would call on a student to tell me what to change, and I would change it on the board. This problem led to so many great conversations. A lot of students wanted to give up. They would even announce that they were giving up and put down their marker. But, soon they would have marker in hand and be trying another strategy. My last period of the day is an 8th grade Algebra 1 class. My school district buses over the 8th graders each day to take Algebra 1 at the high school. I love the excitement and zeal for math that these students bring to my classroom. After letting the class struggle for a minute or two with the problem, I started to work the problem out on the board together. But, everyone was so excited to see how we could edit our number and try to make it work that they ended up requesting to keep working by themselves. I had several students arrive at the solution by themselves. They would raise their hand to have their solution checked. 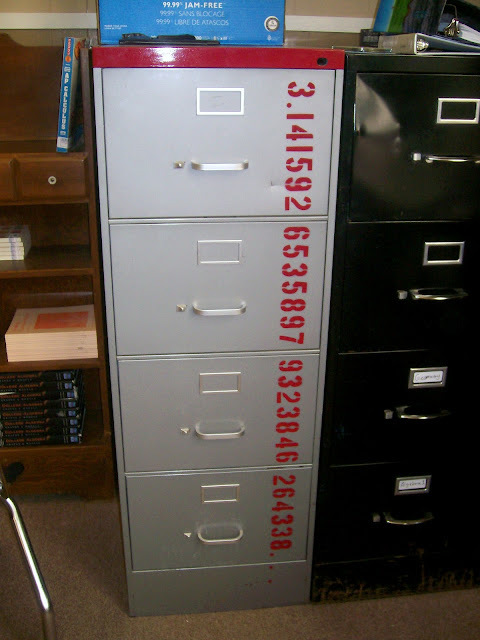 I would start checking to see if they had the proper number of each number. As soon as I found a problem, the student would begin correcting and working again without any prompting. One student announced: "I like this. It's so hard, it's fun." 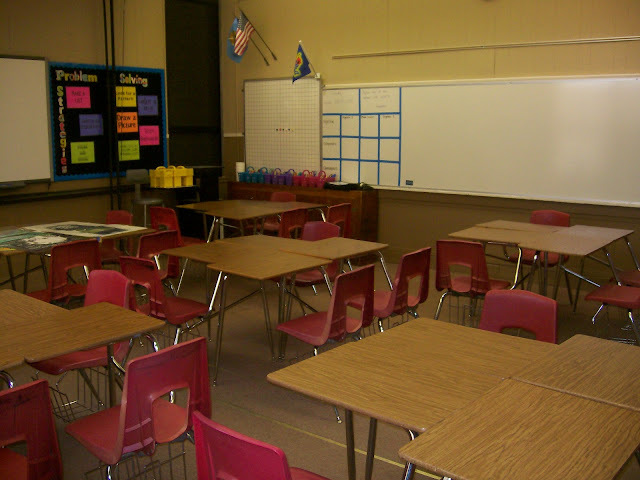 Another eighth grader told the class that this was his favorite class that day because it was the only class where they had done something other than listen to rules. I love this problem. It's a definite keeper. It's the type of problem that students will take one look at deem impossible. The excitement on their faces when they finally find the solution is so worth it! I did have the students compose their #MathIs tweets as an exit ticket. 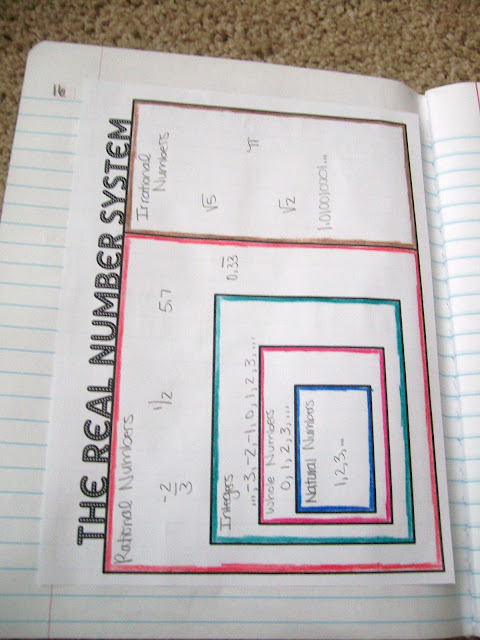 They really enjoyed the activity, and it was such a great window into how these students view math. So many of them wrote of their attitude towards math. 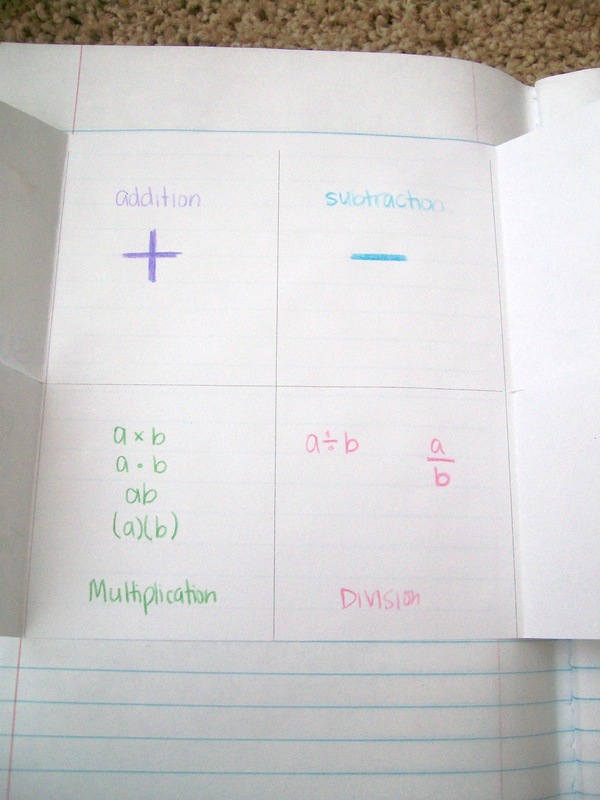 Some were honest and told of their dislike for math but also acknowledged its usefulness. My goal for Day 2 was to practice student names, find out more about my students, tell them about my goals for the year, have my students set goals of their own, and review the syllabus. So many of my students were unfamiliar with the word "syllabus." Throughout middle school, high school, and college, I was always presented with a syllabus at the beginning of the year. Some were more detailed than others, but it was expected that we would go over the syllabus sometime during the first week of school. Thanks to some twitter inspiration, I formatted my syllabus as a brochure. 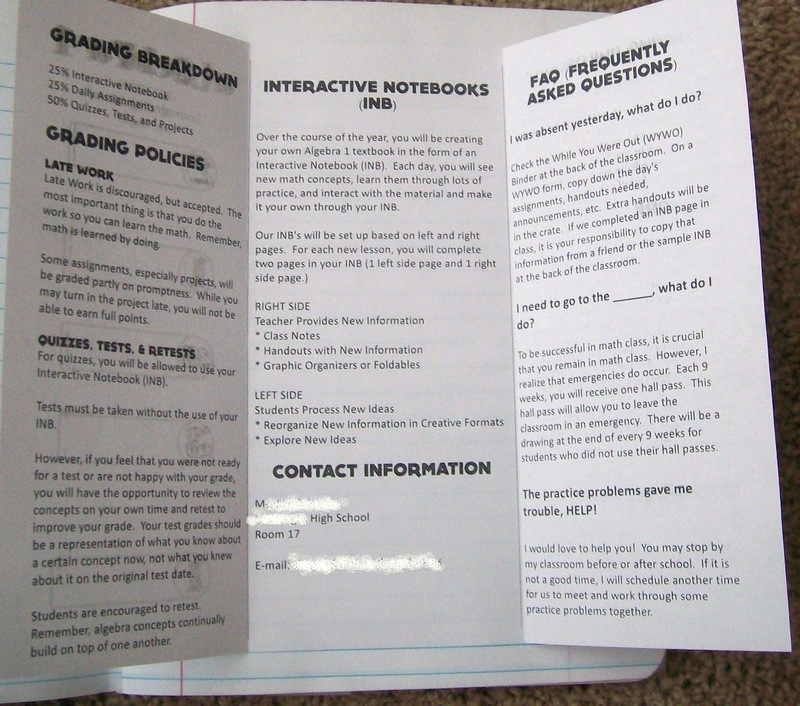 I mainly did this so that students would be able to glue their syllabus into their interactive notebooks. For the front of the brochure, I modified Dan Meyer's syllabus template. For the first day, I also stole Dan Meyer's Who I Am sheet. I had my students complete this as bellwork. Then, each student told me and the class their name and chose one fact off the sheet to share with the class. It was an eye-opening experience. My students' favorite tv shows. I've never heard of them in my life. Awkward. Ridiculousness. Call of the Wild Man. They were pretty appalled that I'd never heard of any of those shows. I told them that I honestly didn't even own a television right now. I keep planning on buying one, but then I start reading reviews, discover that there is no perfect television, and I end up buying nothing. On the back of their Who I Am sheet, I had each student write 3 goals for this school year and 3 goals for the future. I'm so glad I did this. As I'm getting to know my students better, I can keep referring back to these sheets. 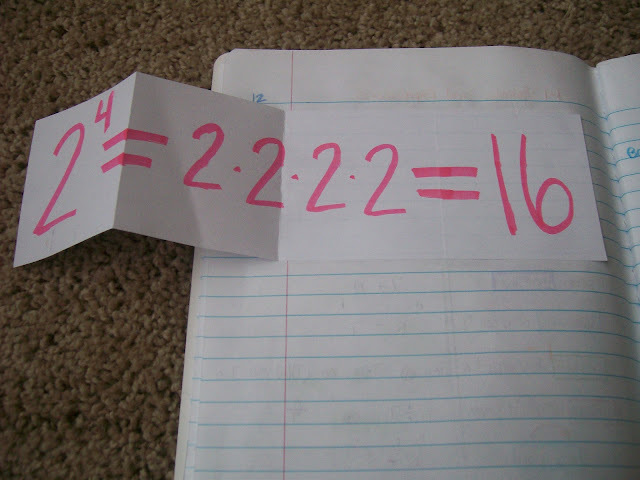 One of the last things I did on Day 2 was try this mathematical magic trick out with my students. Here's the link. You should honestly try this out because it's pretty cool. I did it at home, and it worked. I thought it would spark a good conversation with my students. ***Spoiler alert: If you plan on trying this out and being amazed, do it now before reading the rest of this post! The activity ended up going terribly. You see, I assumed that my students would be able to come up with a country that started with the letter D. (The version I used actually asked for a European Country that started with D.) No. One student suggested that maybe the answer was Denver. They told me that they didn't know the names of countries. Each hour, someone would finally think of Denmark. Then, they would start telling everybody else. And, then they would say their next answer out loud and then their next. So, by the time we got to the end, it wasn't really "amazing" that I could tell them what their answer was since they had kept saying them out loud. 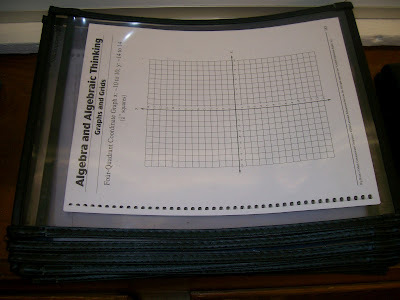 I'm so excited about my Algebra 1 class next week. 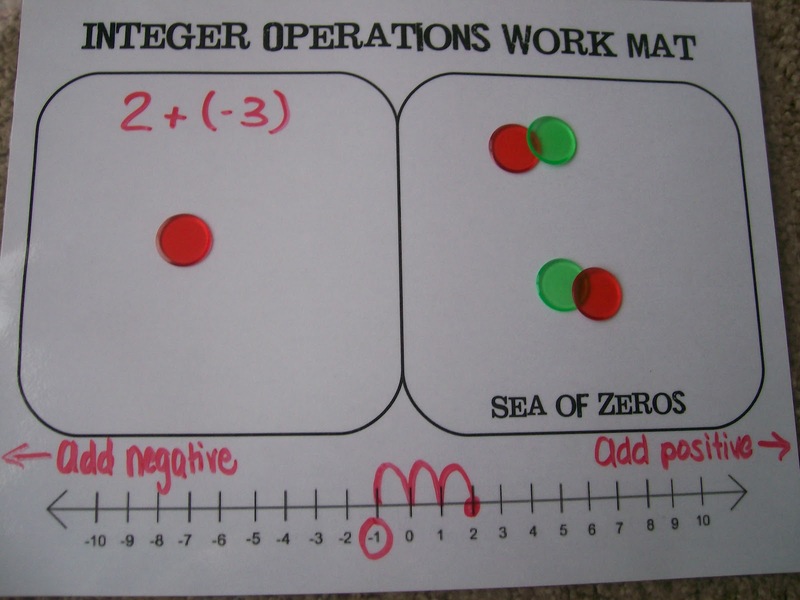 We're starting integer operations. And, I just can't wait to teach my students how to add, subtract, multiply, and divide integers. 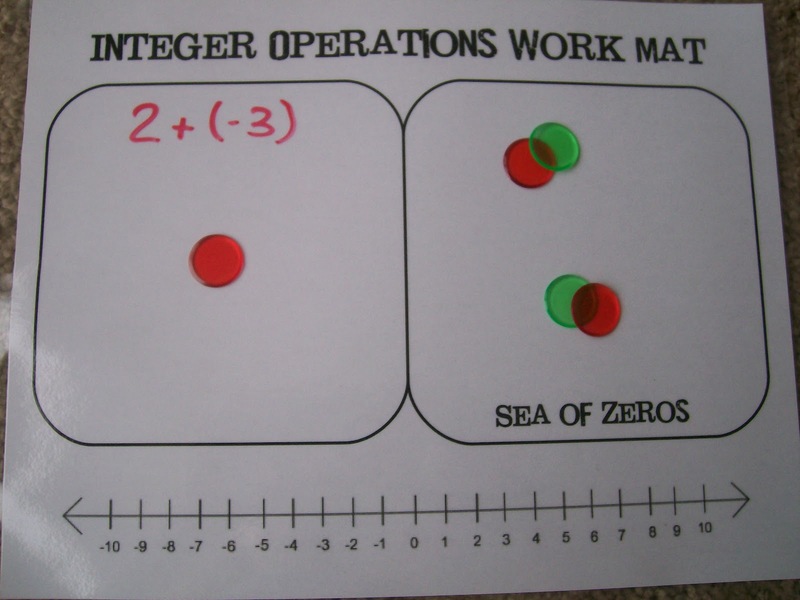 I'm going to cover integer operations in more depth and more slowly than most Algebra 1 teachers would, but it's something I know I have to do. My students don't have a strong pre-algebra foundation to build on. 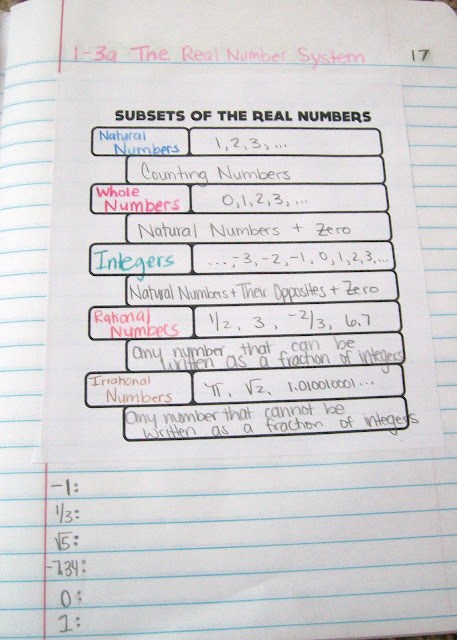 The ability to successfully add/subtract/multiply/divide integers is going to be crucial for their future success at solving equations and graphing. 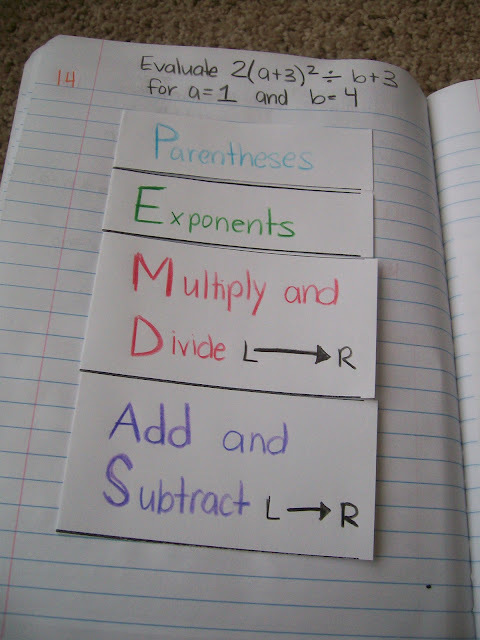 If my students do not master these basics, they will not be able to solve equations, even if they understand the concept of solving an equation. When they subtract three from both sides of the equation or multiply both sides by negative five, that needs to be done correctly, or their answer will be incorrect. My Algebra 2 students never mastered integer operations. 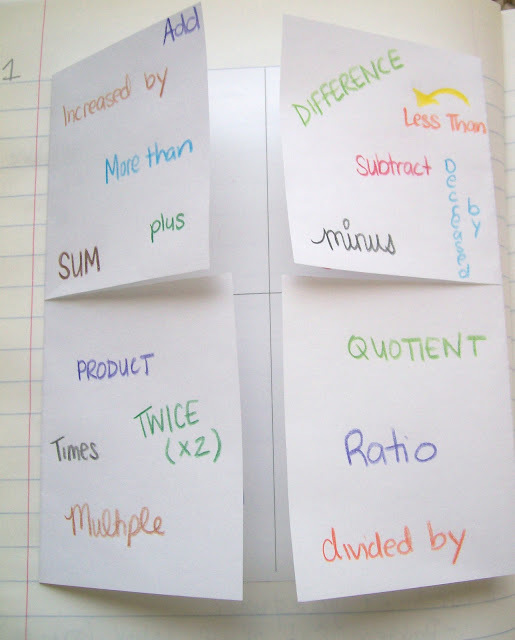 Yesterday, I reviewed how to combine like terms, and the majority of their mistakes could be traced back to not knowing how to add, subtract, or multiply integers. My Math Analysis students have been struggling with the concept that subtracting a negative is the same as adding a positive. I don't want my Algebra 1 students to struggle in the future, so I want to make sure that they fully grasp how to do integer operations. To achieve this goal, I plan on presenting adding and subtracting integers in 3 different ways. The other day, I was looking for a game to review exponent rules in my Math Analysis class. While on Maria Andersen's blog looking at her Exponent Block Game, I found a video of her explaining how to use colored counters. 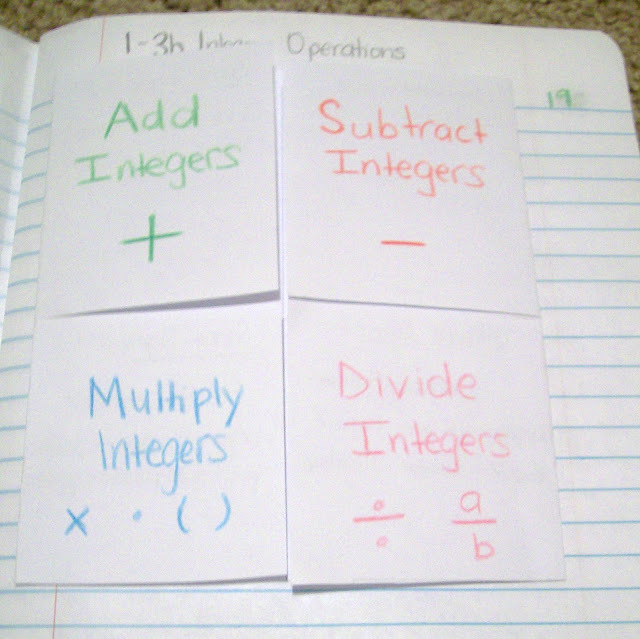 I already knew that I was going to use colored counters to introduce the concept of adding and subtracting integers. My pre-algebra teacher taught us that way. I'd already even ordered bingo chips from Amazon to use as counters. However, I watched her video for some inspiration. And, she used the concept of a "Sea of Zeros." After I saw it explained this way, I knew I had to use it. 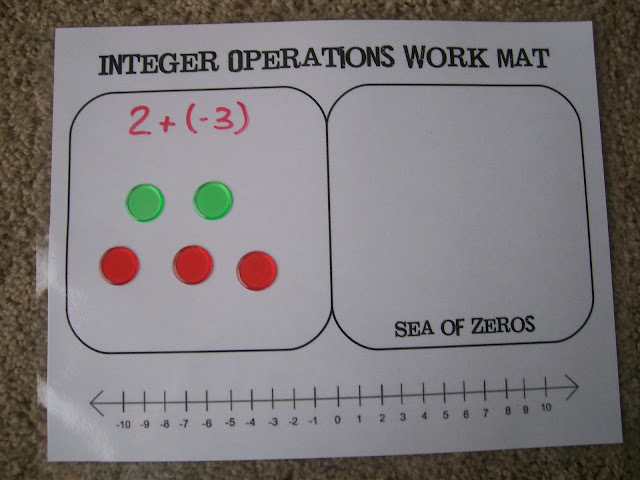 To keep my students organized and engaged, I made a document with a box to place the chips, a box to keep the Sea of Zeros, and a number line. 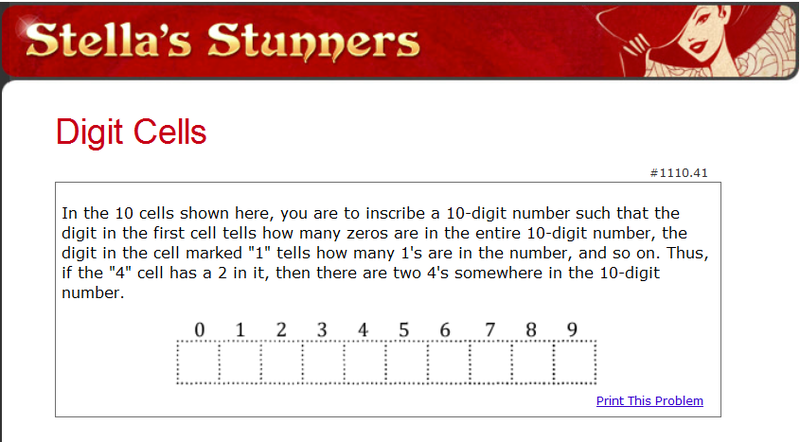 I want my students to see that you will get the same answer whether you use the chips or a number line. I printed off 24 copies of the document and laminated them. Now, they will hold up to multiple classes using them. And, my students can write on them with their dry erase markers. 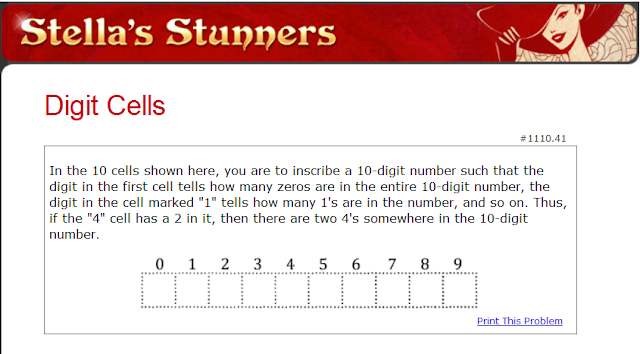 This will be especially useful for the number line. 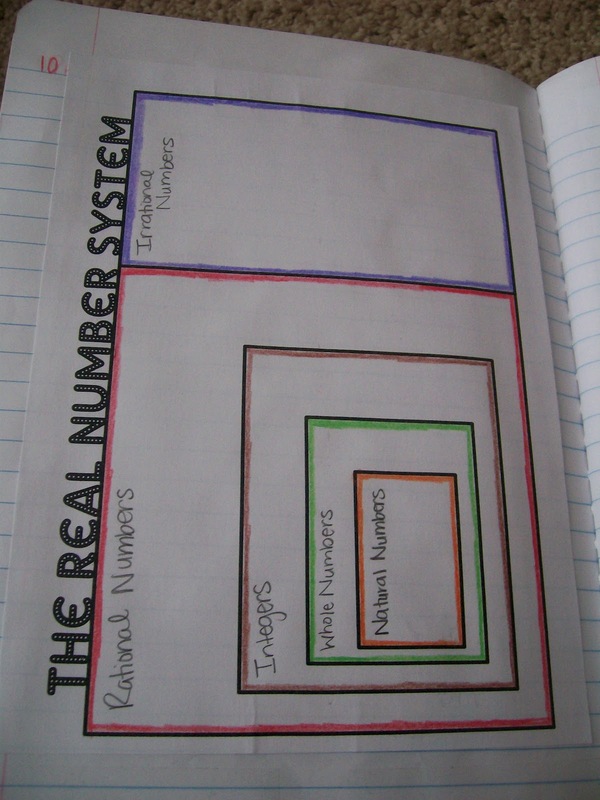 So, I haven't actually taught this lesson yet, but I wanted to share it with the mathtwitterblogosphere. 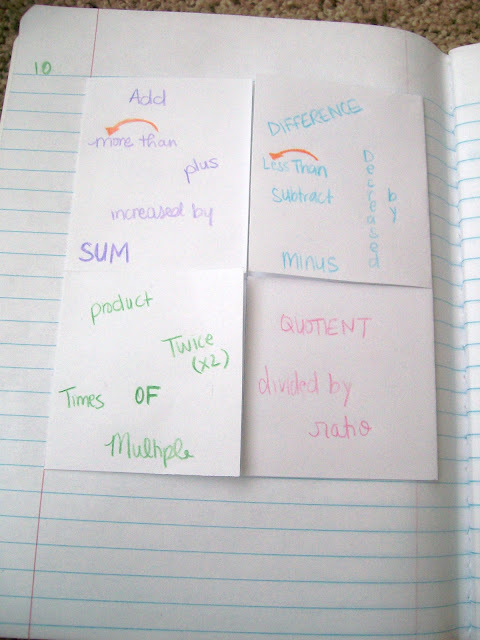 I'm hoping that by introducing it with manipulatives, my students will discover pattern for themselves. I'm so excited for Tuesday and Wednesday! 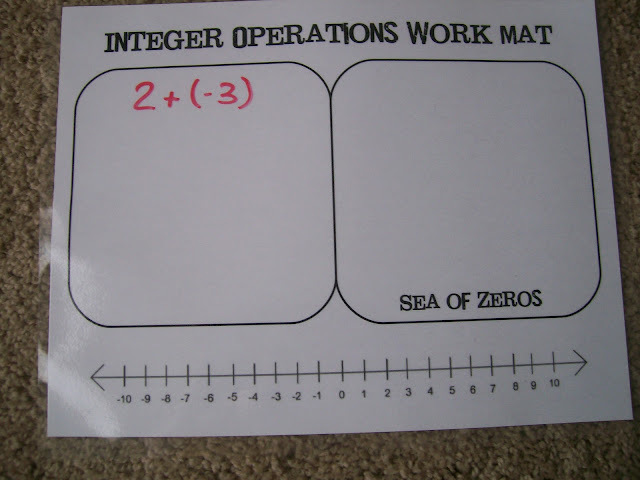 Here's some pictures of my Integer Operations Work Mat in action! Well, after Thursday's post about the good and not so good, I knew I had to post an update about how Friday went. Let's just say it was marvelous. I'm still overwhelmed by student council responsibilities, but I will start dealing with those on Monday. I need to get my lesson plans and everything else ready for next week before I start stressing over student council. My students need to come first. So, Friday was an amazing day. I left school feeling energized and excited to plan next week's lessons. What made it so great? My students. I had at least three different students tell me yesterday how much they were enjoying my math class. In my 3rd hour Algebra 1 class, I had a student raise his hand during the middle of the lesson. I assumed he had a question. No. He just wanted to say "You make math fun." In my 6th hour Algebra 1 class, I had one student just start telling everyone how much she loved this class and that she was learning so much more than last year. This led to another student informing me that this was his favorite class. I don't think my students realized just how much I needed to hear those comments. I didn't ask for compliments or feedback. They just felt compelled to give them. My students are loving the INBs. Sure, some of them make remarks about how all the coloring, gluing, and cutting is like kindergarten, but I think they all secretly enjoy it. 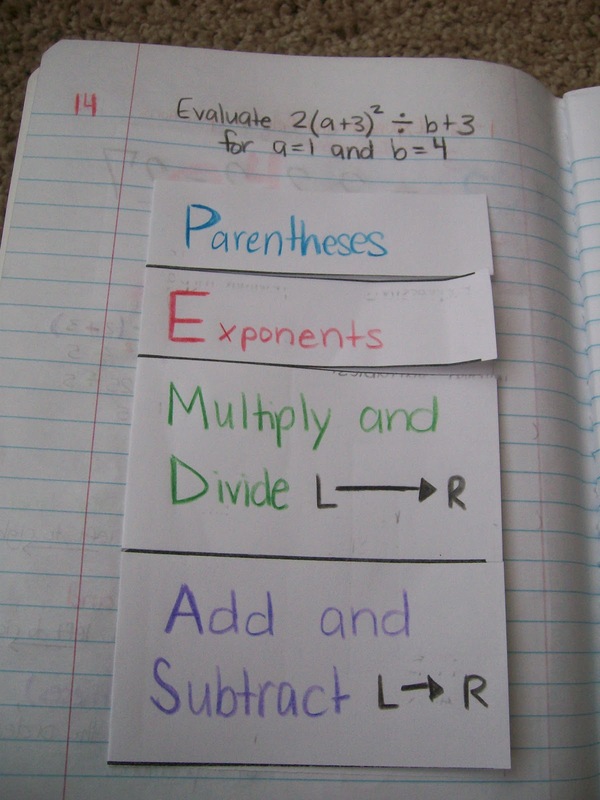 And, I've noticed that when students create the table/foldable/graphic organizer in their interactive notebooks, they are so much more likely to refer back to it than if I had just referenced it in the textbook. I've been using the individual dry erase pockets, and I think they have made a major difference in my students' attitudes about math. Maybe I shouldn't admit this, but I'm not a fan of math homework. I attended a high school where very few students did their own math homework. A few students would do theirs and then answers would be copied from student to student. No learning was occurring. Only copying. Then, I student taught at a school where students didn't do their homework. The school allowed students to turn in late work at any time without a penalty. So, the students were typically 3-4 weeks behind in doing their homework, if they did it at all. Instead of assigning homework problems, I've been giving my students the problems that would normally have been homework to do on their dry erase pockets. I read a question or put it up on the Smart Board. 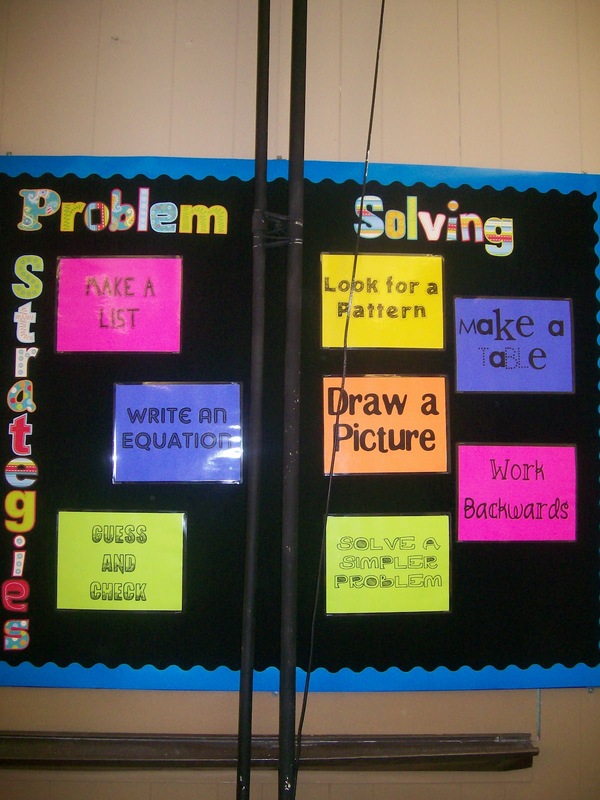 Each student works the problem and holds up their solution. I say yes or no. If they got it wrong, they look back over their work. The students that got it right start helping those others setting at their table. I love having my desks arranged like this! It's perfect for encouraging students to communicate and discuss the problems we are working on. My students love it. They actually look forward to working the practice problems. That sounds crazy, right? 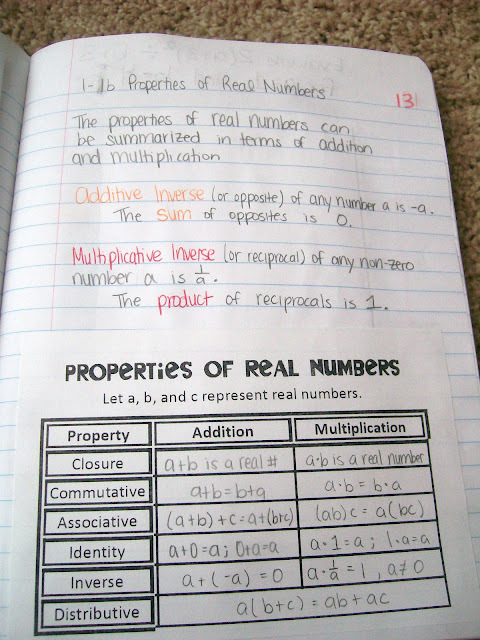 Students looking forward to doing math problems. But, it's entirely true. And, I think I've figured out why. 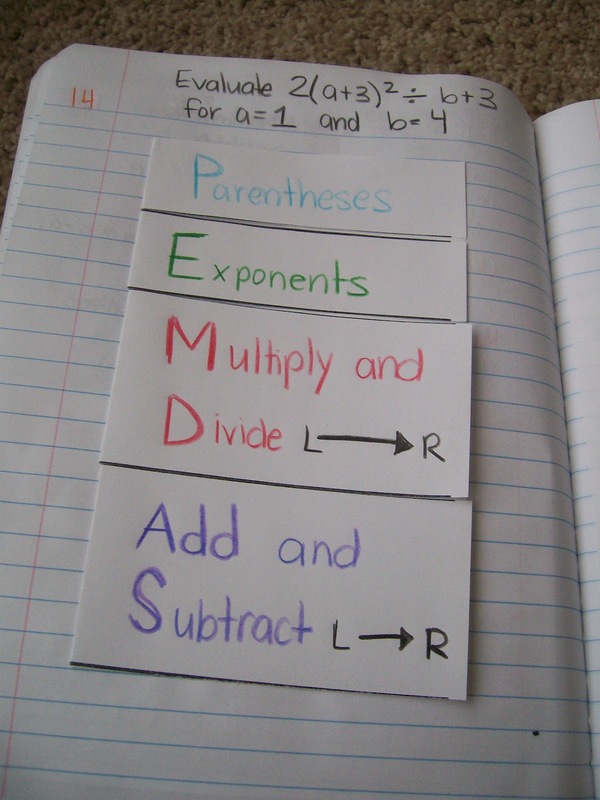 Most of my students have traditionally struggled with math. They haven't been successful before. Math leaves them feeling frustrated. When I give my students 10-15 practice problems, what I'm actually giving them is 10-15 chances to leave class today feeling like a success. To the students that understand the lesson from the beginning, they leave my class feeling like a math super star. To the students that don't understand at first but start to get it through lots of practice and help from their classmates, they leave my class each day feeling like they've got this. Every student is engaged. 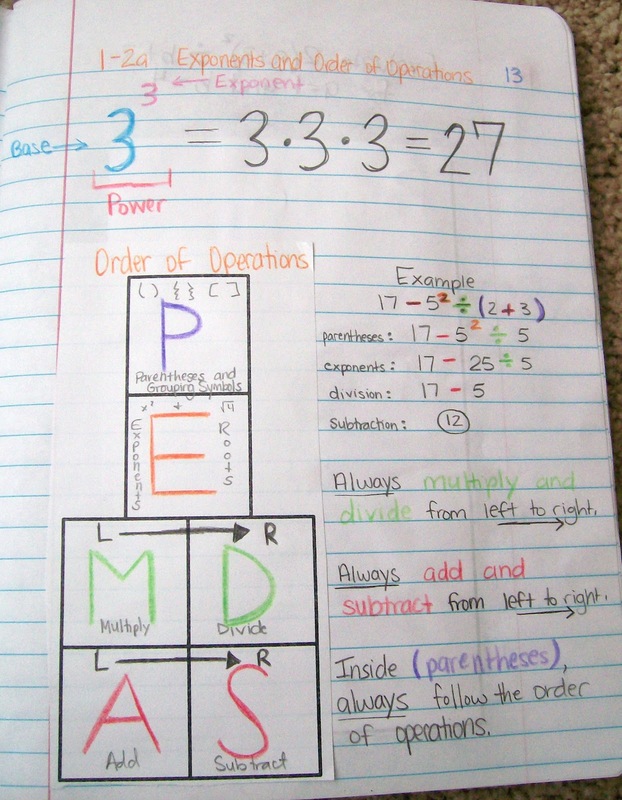 Every student works every problem. We work problems until the bell rings. I try to ensure that no time is wasted at the end of class. My students don't have homework. I don't have piles of homework papers to grade. And, there's just something about that dry erase marker that makes my students more apt to try a problem that they aren't entirely sure how to solve. 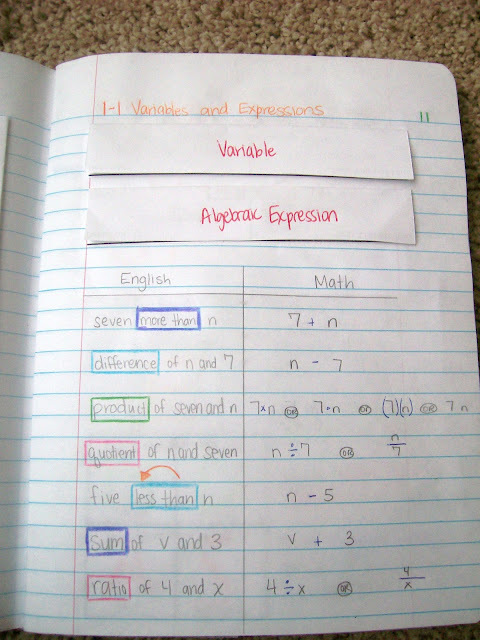 Teaching with interactive notebooks and dry erase pockets makes me love my job. I'm moving through the sections a tad slower than the other math teacher, but I think it's worth it. 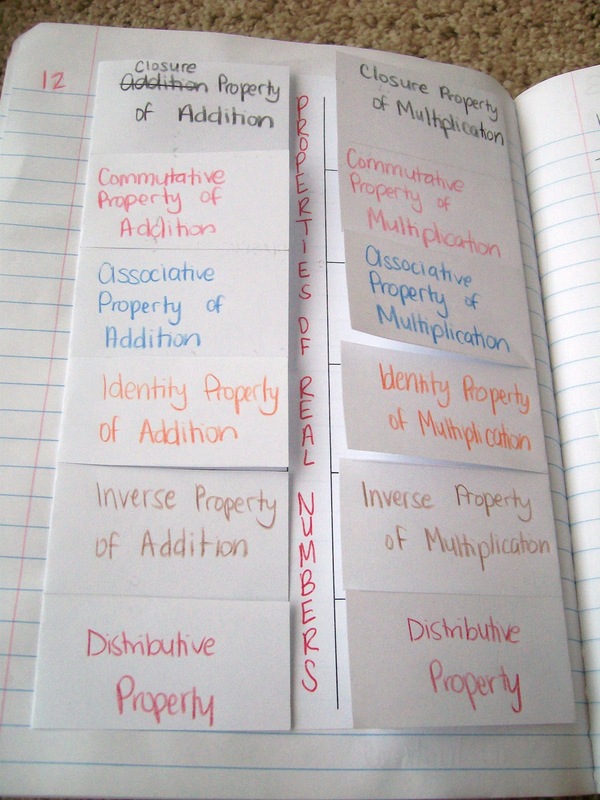 I'm building a strong foundation for my students that will pay off for the rest of their mathematical careers. I'm able to give my students instantaneous feedback. They don't solve 20 homework problems and wait a day or two to figure out if they really understood how to solve those types of problems. By then, they don't really care. Each time my students finish a problem, they want to know immediately if they got it right or not. If not, they are anxious to find their mistake. They want to hear that "yes." 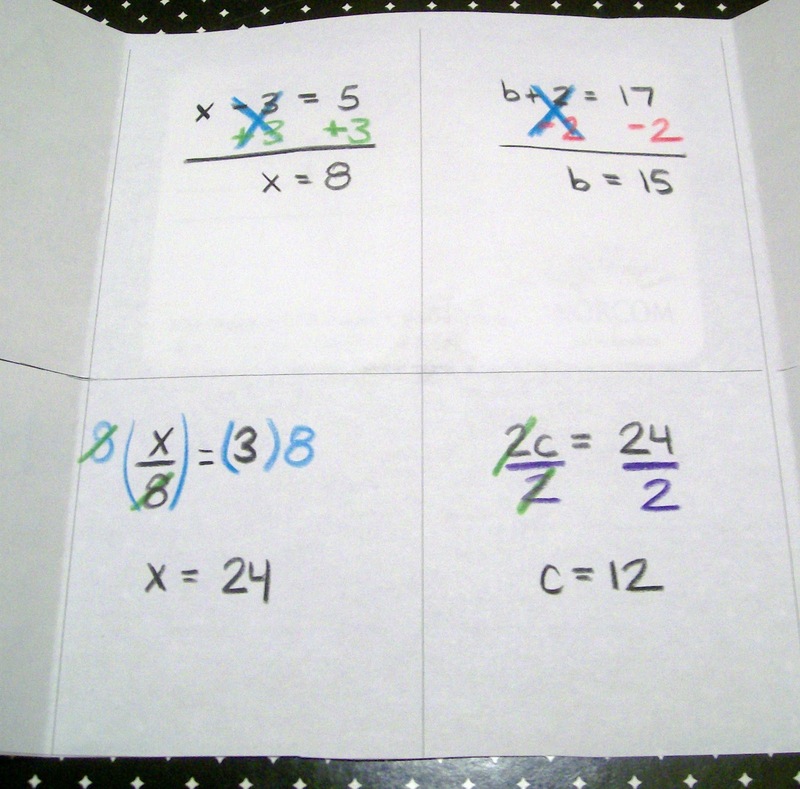 I'd originally planned to give my students a few problems at the end of each period as an exit ticket. But, I've discovered that with doing all the problems on whiteboards, that's not necessary. I know which students have it or don't. So, I'm trying to find a better way to do exit tickets. I still love the concept. I just want to find a way to get more meaningful feedback. I also had a really interesting/strange thing happen on Friday. In the middle of my math analysis class, there was a knock on my door. I answered it to find the secretary and one of my neighbors, a retired man that lives two doors down from me. So, I open the door, and the secretary goes "This is your neighbor." So, I'm like "Hi." My mind is racing, trying to figure out why my neighbor would have come and visited me at school. I've only met him once before when I was moving in at the beginning of July. I'm thinking that my house must have burned down or something. No. He just wanted to let me know that he wanted to give me a couch that he had. It was a beautiful couch, and he had heard that I was needing some furniture. I actually have a very nice, matching living room set and a house full of furniture. So, I had to turn down his offer of a couch. So, I guess this is what it's like to live in a small town. I'm just trying to imagine what the conversation was like in the office before they brought my neighbor down to my classroom. My neighbor doesn't know my name. What do you say? "My neighbor is your math teacher, and I need to talk to her about a couch?" Announcement: I created a new page at the top of my blog! 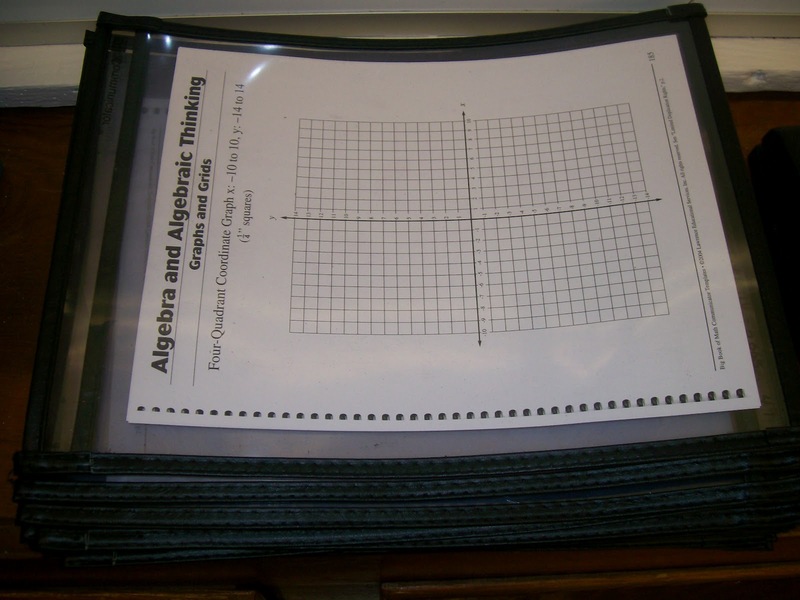 Click the tab above to find links to *almost* all of the foldable templates, graphic organizers, forms, and downloads I have created! Well, today has had some really high moments and some really low moments. Before I head off to bed, I want to take a moment to reflect on today. I've been terrible at blogging since school started. I think it's my perfectionism. I have an idea of what I want my blog posts to be like. Creative. Full of pictures. Reflective. And, honestly, I don't have time for all those things right now. I'm trying to figure out how to manage my first year of teaching and 3 preps. Plus, I'm the Student Council Sponsor, National Honor Society Sponsor, and Freshman Class Sponsor. I don't really know what I'm doing. I'm just making it up as I go and hoping that I don't drown. So, I'm just going to record this in all its imperfection. - They installed my new projector today after school. So, tomorrow, I can use my Smart Board and document camera! This is going to make the process of showing students where I want things glued in their INBs so much easier! - The superintendent stopped by my classroom today. He knocked on the door and asked me to step out in the hall for a moment while I was teaching class. One of my 8th graders had been telling him how much he and the other students loved the new math teacher on the way back from the football scrimmage. So, he just wanted to tell me that and let me know that I was doing a great job. - The schedule and my class rosters are still changing. I was originally teaching 3 classes of Algebra 2. However, I had one class with one student and one class with two students. So, they combined my three Algebra 2 classes into 1 class and added two new Algebra 1 classes. But, then one of my Algebra 1 classes only had 3 students in it. So, they cancelled my Algebra 1 class and moved those students into the Algebra 1 class across the hall. 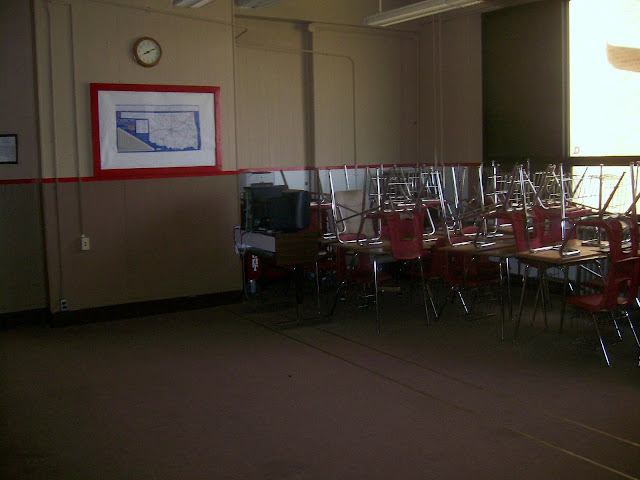 But, today, they decided to take the class across the hall and split it. So, I will teach half the students, and the other teacher will teach the other half. So, tomorrow, I will meet 9 new students. (I'll actually have 10 students in my class, but one student was previously in my class of 3.) I don't know how to get these students caught up with the INB because the other teacher is not using INBs. 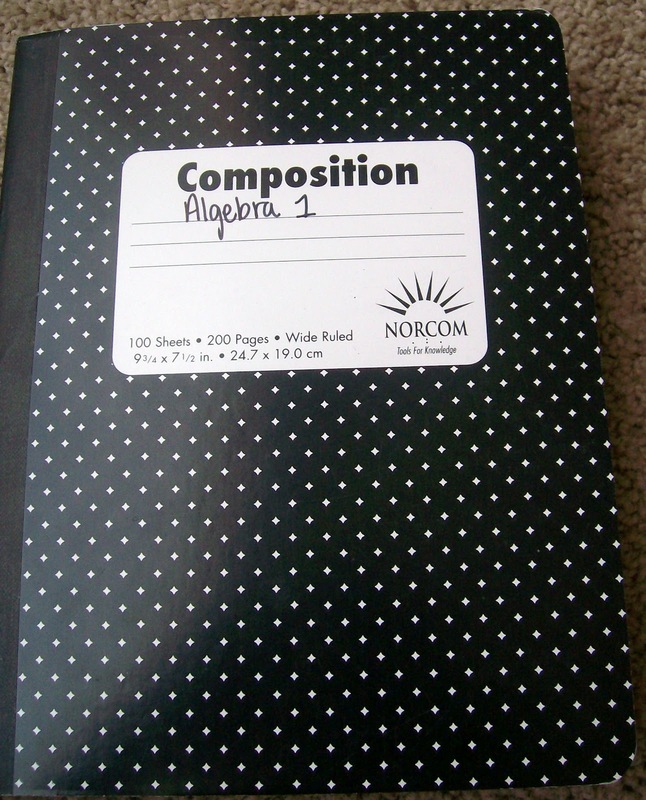 They won't have composition notebooks. 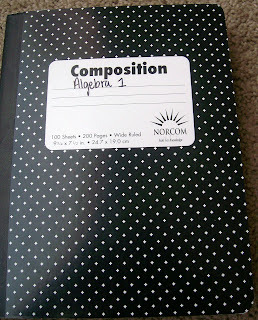 And, I don't really have time to wait for them to come up with a composition notebook. I need to keep moving ahead in order to keep all 4 of my Algebra 1 classes at the same point. 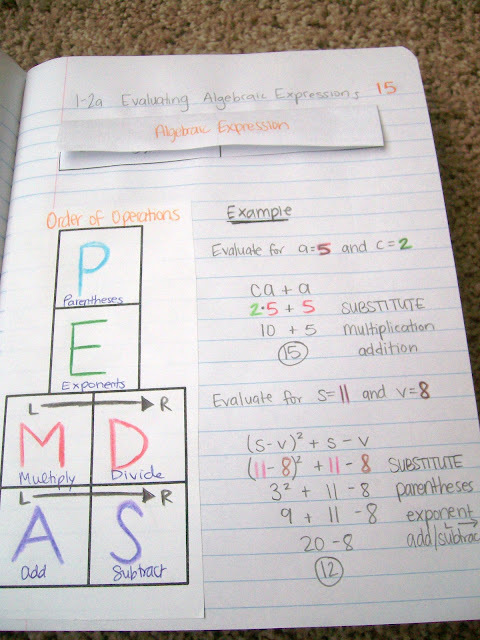 - I need to figure out a different way to approach my College Algebra / Math Analysis class. I came in assuming that this was going to be an advanced math class. These students have already taken Algebra 2. So, this class is an elective for them. However, from teaching them this week, I've discovered that topics I assumed would be a review are topics I need to teach in depth. These students are struggling with adding fractions, graphing inequalities, and exponent rules. Tomorrow, half of this class (There are only 7 students) will be gone for softball. So, I need to come up with a plan this weekend for how I want to approach this class from this point forward. Well, we're four days into the school year now, and I'm still alive. I feel like I'm treading water. I'm trying my hardest not to drown. This is one of the hardest things I've ever done. It's also one of the most rewarding things I've ever done. A lot of the stress and craziness that has come with the start of school is just a result of my perfectionism and high standards for myself. I don't want to teach the way I was taught. 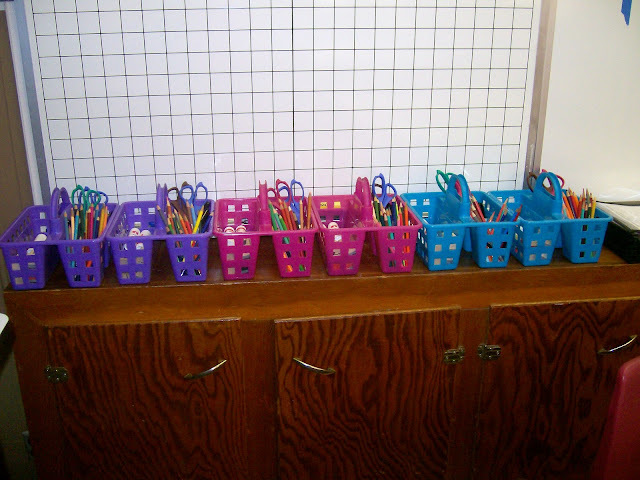 I know what I want my classroom to be like, and while it's doable, it's also time-consuming. I've been getting to school at 7 and not leaving until after 5. Then, I go home and do more school work. I'm pretty sure that the hours I've been keeping would qualify me as a workaholic. Honestly, the first few days of school have been great. I have a great group of students. Problems with schedules have made these first few days a little more stressful than I would have liked, but the problems are being solved. I've gone from teaching 3 Algebra 2 classes and 2 Algebra 1 classes to teaching 1 Algebra 2 class and 4 Algebra 1 classes. I'm also teaching a College Algebra course, but that hasn't changed any. I'm really starting to wonder how all you amazing math teacher bloggers manage to find time to blog and tweet and teach and have a life. Since school has started, I've written half a blog post, not counting this one. Honestly, I would have put off writing this post a few more days if I hadn't gotten the e-mail with the second week of prompts for the new blogger initiative. So, this week, I want to write about two goals I have for this school year. 1. 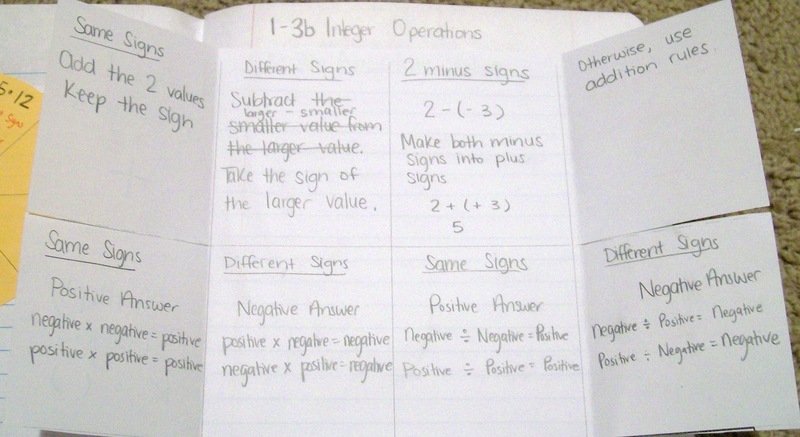 Implement Interactive Notebooks (INBs) in my Algebra 1 and Algebra 2 classes. From starting to work with these with my students, I can tell you they are a lot of work. 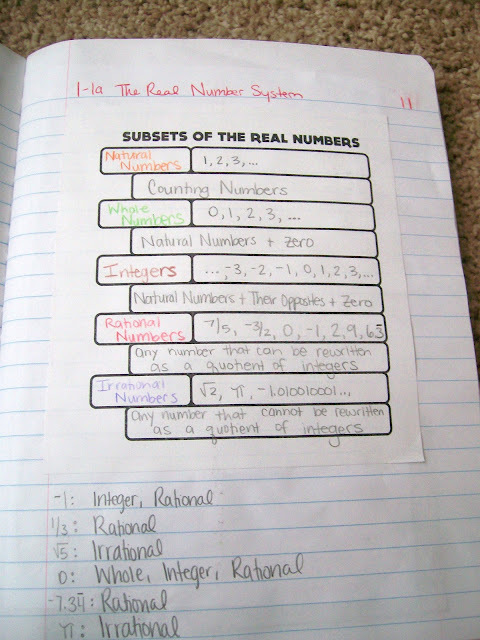 I've spent hours creating pages, foldables, graphic organizers, and other exciting things. 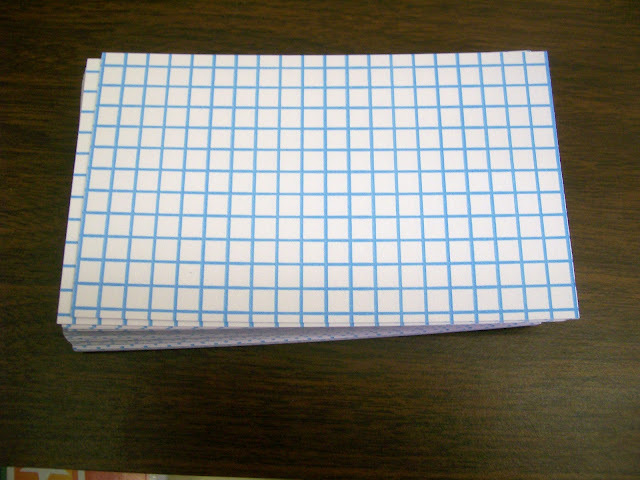 I think I use the paper chopper more than the rest of the teachers in the school combined. I never realized that gluing and taping and coloring and cutting could be so time-consuming, but, I'm already seeing the benefits. My students are more engaged. When they have created the foldable or filled in the graphic organizer, they are more apt to look back to it for help than if I had simply referenced the table or chart in the textbook. So far, my students love them. 2. Build relationships with my students. I teach in a small school. We have 150-160 students in 9-12. Everybody knows everybody. Except me. I'm not from this town. I've lived here a little less than a month. I know that a lot of my success as a teacher will depend on the relationships I develop with my students. They need to know that I am trustworthy. They need to know that I care. I've been trying my hardest to learn all of my students' names. 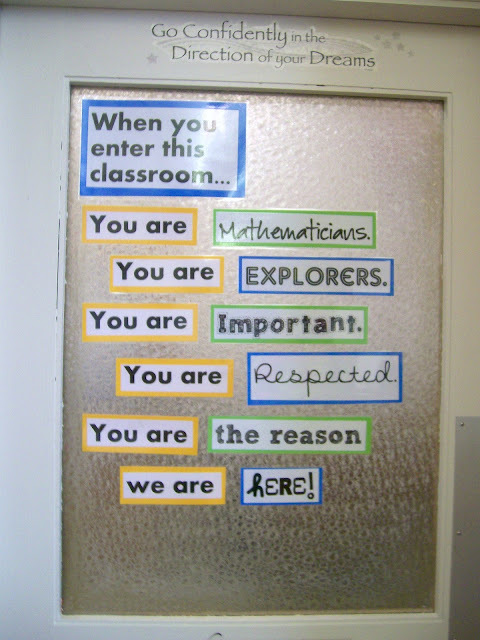 Students are aware if their teachers know their names or not. I practice each morning as students enter my classroom. I try to greet each one by name. When I collect exit tickets at the door, I thank each one by name. When I walk around the room and check for understanding, I call each person by name. I used Dan Meyer's Who I Am sheet on the 2nd day of school, and the results I got from it were pretty amazing. As I learn more names and put names to faces, I want to keep reading back over these papers so I can have an idea of each students' background. I also had each student write 3 goals for this school year and 3 goals for the future on the back of their Who I Am sheet. Some of their goals made me smile. Others made me want to cry. Another thing I did to try to build a relationship with my students is to ask them to help me learn more about the town. I did this as an exit ticket on the 3rd day, and I asked each student to write down 3 suggestions of things I should do/visit/see/experience to truly get to know the town. I learned more about the town. Several students invited me to sporting events. Some great conversations were sparked. I'm so thankful for my student teaching experience, but teaching in my own classroom is entirely different. Or, at least I am approaching it differently. During my student teaching, I made an effort to learn my students' names. Some shared with me about their interests and activities. But, they were never really my students. I knew I would only be there for 8 weeks. They knew I would only be there for 8 weeks. But, with my own classroom, it's different. These are my students. I find myself so much more motivated to help ensure the success of each and every one of my students. I take notes about things I have found out about my students. I'm going to implement a seating chart in my 2nd period tomorrow. I'm doing it because my students need one in order to have an environment conducive to learning. The decision making I found so hard to do during student teaching has become second nature. My days are filled with one decision after another. From hour to hour, I make decision to tweak things. I take out an introduction. I add an extra explanation. I learn from what has worked and what hasn't worked. Every day is a learning process. 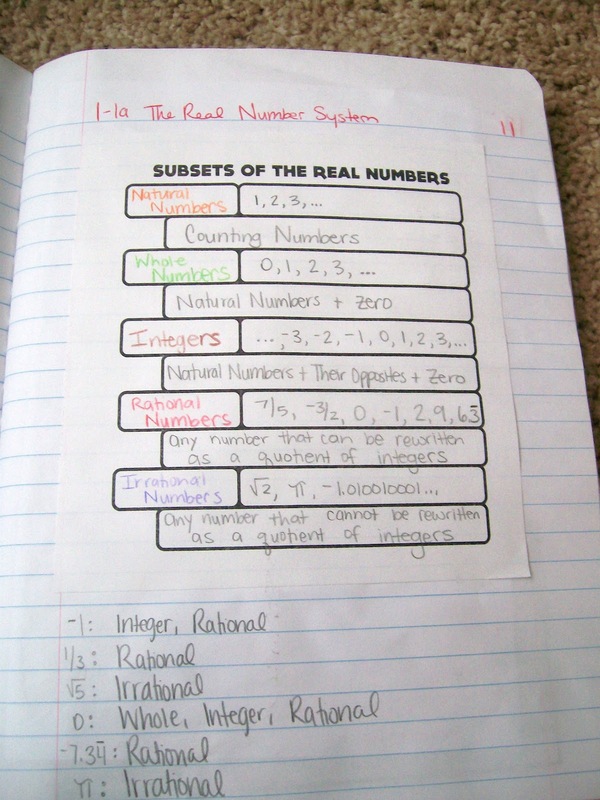 With each lesson I teach, I learn how my students need information presented to them. Instead of focusing on what I should have done better, I focus on how to make my future lessons better and more effective. I learn from my mistakes. I am a teacher. Every time I walk in the door of my classroom, I see the decorations, and I just get so happy. I'm sure the newness will wear off soon, but I'm enjoying it for now. School starts tomorrow. Yes, tomorrow. I don't even have class lists yet. I guess I'll get them in the morning... I'm excited for the first day. I'm excited to get to start knowing my students. I met several students and parents at open house / meet the teacher night on Tuesday, but there are so many more that I haven't met. Plus, most that I did meet didn't know what math class they would be in, so I didn't even know if they would be in my class or not. My school ordered new projectors for the teachers, but they haven't been installed yet. So, I'm having to put my beautiful, new (to me) dry erase board to good use for the first of the school year. 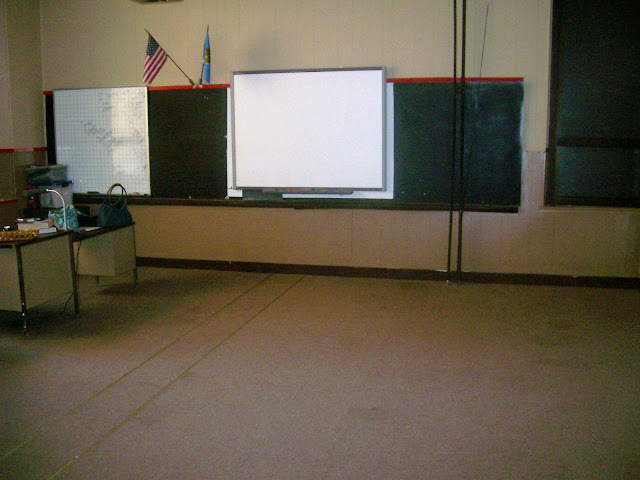 Hopefully they'll have my projector and Smart Board up and running soon. Right now, my projector will come on for 20 seconds then shut itself off. 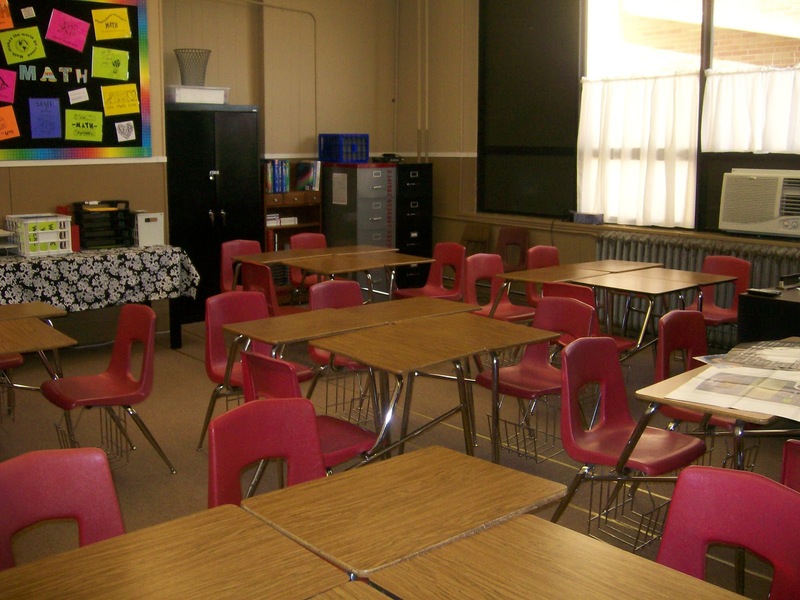 I'm very excited about my class sizes. I got a peek at the unfinalized rosters today, and my largest class was only 14. These are like the class sizes of my dreams. This is a definite pro of working in a small district. Since my room has been mostly finished for the past few days, I've had the opportunity to get to know a lot of the other teachers. We have 5 returning teachers and 7 new teachers. (Not to mention a new principal and new secretary. The superintendent is also new.) The other math teacher is also new. This is his first year of teaching, too, so we've been sharing ideas and trying to figure out things together. A few students stopped by my room this afternoon while I was working, and their reaction to my classroom made all the hours I've put into it so worth it. They were literally gushing to one another about how much they loved my classroom. "It's so bright." "You got a markerboard!" "You painted the door!" "Everything is so colorful!" "It looks so different!" And the most common response: "It's so cute!" 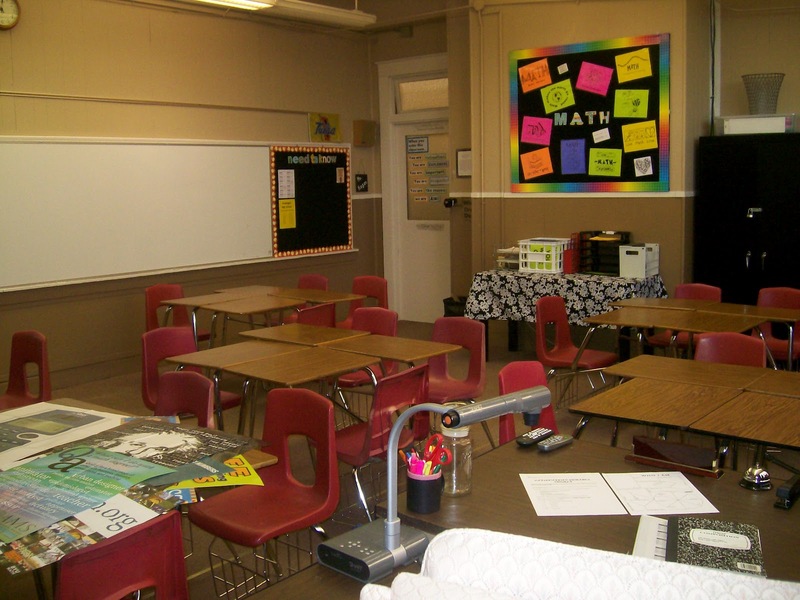 Does it really matter if students like my room? Yes and no. 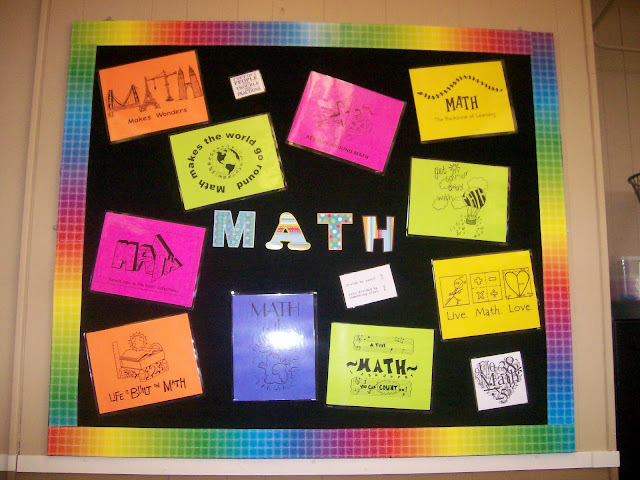 I don't have to have decorations to make me an effective math teacher. But, I'm going into a school where the students don't me, and I don't know them. First impressions definitely matter. For a small school, we've had an incredible teacher turnover rate. When students enter my classroom for the first time, I want them to get a sense of how much I care. I want it to be a positive learning environment - a place they look forward to coming to. 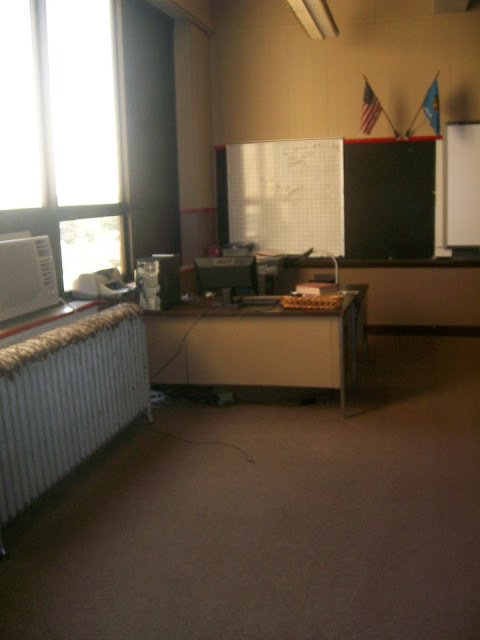 And, my classroom makes me incredibly happy. The posters, the bright colors of paper, the beautiful bulletin boards my parents made for my classroom, the whiteboard my parents got me off craigslist, the way the desks are set up - all these things make me smile. I think students can tell whether or not a teacher takes pride in the way his or her classroom looks. So, without further ado, here are some before and after pictures! My Smart Board was surrounded by shower board that someone had painted black. I knew from the start that I needed to find a way to utilize the space around my Smart Board. And, see that small graphing white board? That was the only white board in the classroom. 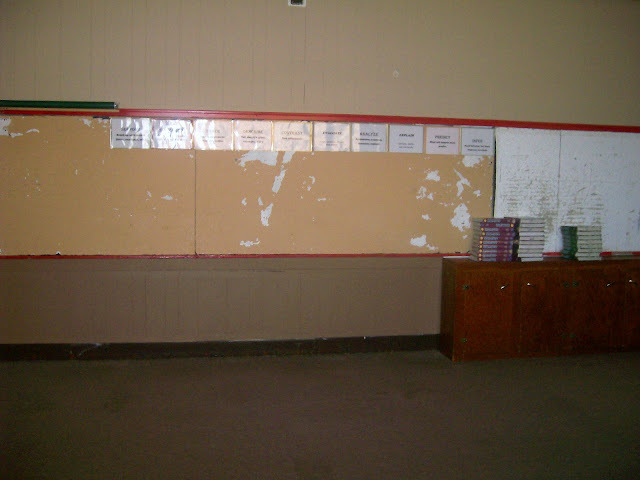 Sad looking homemade bulletin boards that were created to cover up the original slate chalk board from when the school was built in 1919! I don't have a picture of the 4th wall because it's a wall of windows. But, you can see part of it from here. They had stacked the desks in order to shampoo the carpet. But, traditionally, this room had been set up in rows. 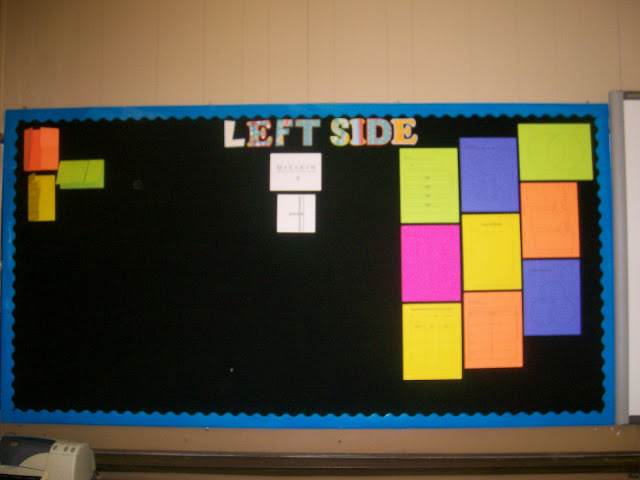 Left Side Bulletin Board: This board will remain a work in progress throughout the school year. As I learn new, creative ways to do the LHS of our INBs, I will add to this board. This is the bulletin board I plan on changing out as the year progresses. 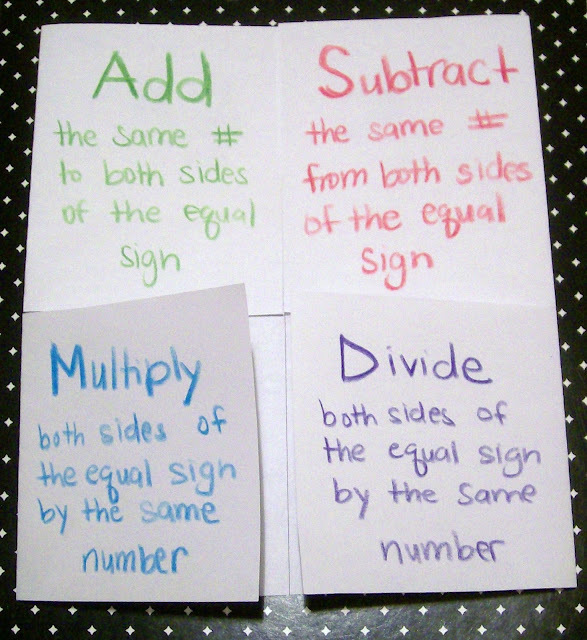 I'm starting the year with math posters that I downloaded, printed, and laminated from the North Carolina Council of Teachers of Mathematics. My Door Decoration. I modified this from one I saw on Pinterest. My sister helped me make a grid on my whiteboard out of blue painters tape. I wanted a dedicated spot to put the day's objective, assignment, and any announcements. I also put up the date (as a math problem - my cooperating teacher did this every day during my student teaching at the middle school level) and a quote of the day. 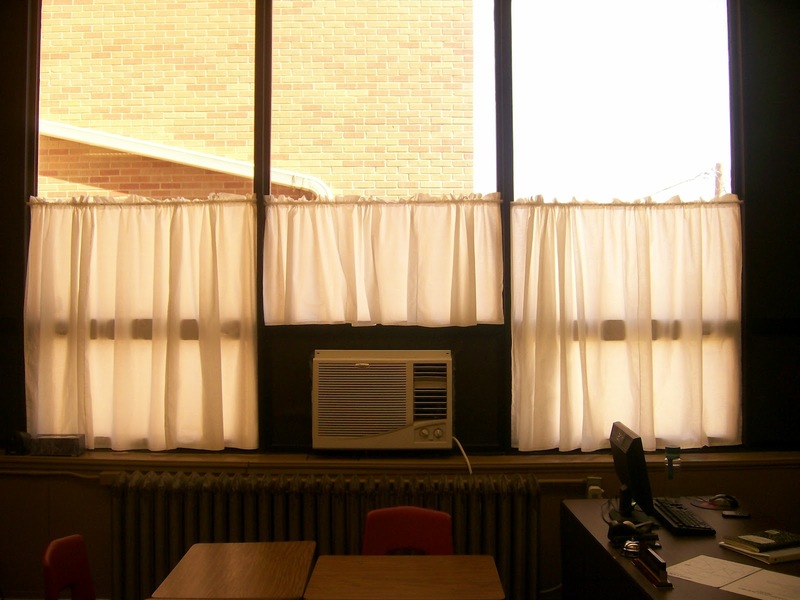 My mom made curtains for my classroom. And, I love them. I look at pictures of other people's classrooms, and I get a little jealous when I see just how much space they have. I have 24 desks in my room, and as you can see, they are a little squished together. I love my whiteboard. It's 15 feet long and beautiful. My parents got it off craigslist and drove over an hour to bring it to my classroom and attach it to the wall. 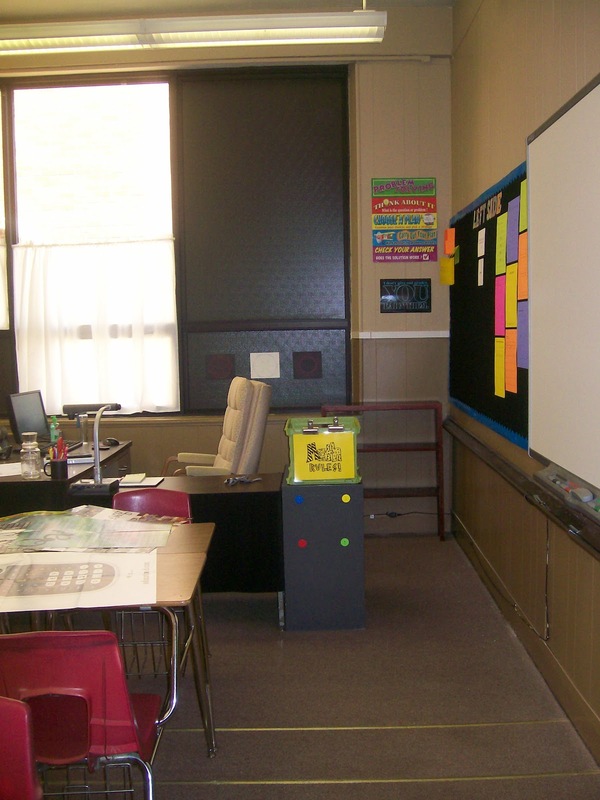 So, if my Smart Board doesn't work for some reason, I will have a place to write! Plus, it's always good to have a place to write reminders and work problems. They also hung up my map rails above my white board so I will have a place to display student work.